Master watchmaker Heinrich Moser was also an enlightened man of business, an astute entrepreneur and an industrial pioneer internationally as well as in his home town Schaffhausen. Using his entrepreneurial spirit, he further evolved the watchmaking craft, putting in place a truly international service and importantly, a network of specialist retailers. 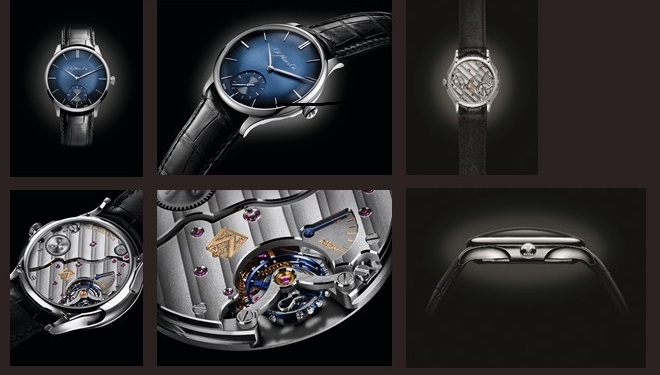 A long-term partner of H. Moser & Cie., Bucherer shares many values with the company that has been called the "little pearl of Schaffhausen": both are independent Swiss companies, based in German-speaking Switzerland and both were founded in the 19th century; H. Moser & Cie. in 1828, and the celebrated retailer Bucherer in 1888. Today, H. Moser & Cie. pays tribute to Bucherer by creating the Venturer Small Seconds Bucherer Edition. The particular feature of this timepiece is the colour blue; presented on the all-new midnight blue fumé dial and on the exclusive balance wheel and hairspring, created especially for this model. Venturer: the name evokes the successful business ventures of Heinrich Moser and celebrates his entrepreneurial spirit. The Venturer Small Seconds Bucherer Edition is the latest addition to the Venturer collection, which was unveiled during Baselworld in 2014. The red gold models are joined by this new version in white gold. Elegant, refined and exquisitely understated, this creation reinterprets the design codes of the Venturer family, with clean lines and a design inspired by the historic pocket watches of H. Moser & Cie. and convex forms typical of the 1960s. Similar to the red gold versions, the Venturer Small Seconds Bucherer Edition features a convex profile, emphasised by its domed sapphire crystal, the line of which is reflected in the dial and the long, tapered hands with curved edges. The refined, elegant bezel offers a beautifully clear view of the dial, revealing its exceptional colour. The iconic H. Moser & Cie. fumé dial is available in a brand new midnight blue version, whose sunburst pattern adds an extra layer of detail. The back of the watch is no less exceptional, with a blue hairspring and balance wheel visible in the hand-wound HMC 327 calibre. H. Moser & Cie.’s sister company Precision Engineering AG assists with the in-house expertise necessary to design, develop, produce and assemble the highly-specialised technical components such as the balance wheels and hairsprings. This expertise was instrumental in developing the blue treatment, creating an impression of depth in the escapement. The result is a piece that features mysterious and constantly shifting sapphire reflections. The Venturer Small Seconds Bucherer Edition will be available exclusively at Bucherer in Switzerland, Germany and Austria.